As a people who have endured millennia of harsh climatic and socio-political changes we join together to confront the danger of climate change. We remember that the Jewish tradition, in both Midrash (interpretation) and Kabbalah (mysticism), views the earth as a temple. We also remember that as Jews we look forward to redemption, a time when the seed of hope for a transformed society rooted in healing and justice, love and peace, is planted and blooms in every heart. As Jews committed to Renewal, ALEPH Alliance for Jewish Renewal, stands with Ohalah and The Shalom Center and call upon every Jew, as well as every adam, earthling, to reflect upon the impact of climate change on this Holy Temple that is our Planet Earth, to turn and take action, large and small, toward a better future. We recognize that climate change is a danger to our economy and ecology, and a threat to peace between nations and to our food security. Climate change is already contributing to the extinction of many species and undermining the web of life that sustains all of us. We also acknowledge that the climate crisis is both a material and a spiritual crisis, and addressing the climate crisis is the responsibility of all peoples and all religions. 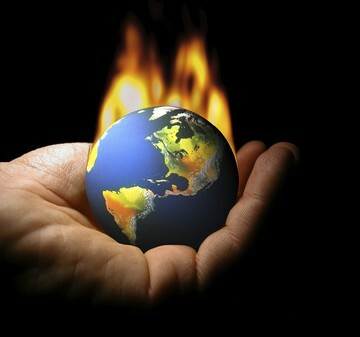 The burning and extraction of fossil fuels, such as coal, oil and methane, and the destruction and development of critical habitat and vast forests, all contribute greatly to the climate crisis, which is commonly called global warming but which is actually a human fueled imbalance in our global climate systems. Many of the methods for extracting fossil-fuels, such as fracking, exploitation of tar sands and drilling for oil in the ocean depths, and mountaintop removal, are in themselves devastating to the environment. Scientists believe that climate change is already contributing to droughts in Australia, Russia, central Africa and the United States Corn Belt; to deadly heat waves, to more powerful and frequent tornadoes in the U.S. Midwest and to superstorms like Hurricane Sandy; to floods in Pakistan and other areas of South Asia; and to vast wildfires in the United States. In the world of Spirit (Atzilut): The Torah teaches that we are all created in the image of the Divine. The Torah also teaches that the word meaning human, adam, comes from the word meaning earth or soil, adamah. We call on individuals, congregations and communities to include the healing of our planet in our prayers, and to acknowledge the inter-relationship of adam and adamah in our prayers, rituals, and celebrations of festivals and life cycles. We encourage the use of liturgies that address climate change directly. In the world of intellect (Beriah): We call on individuals, congregations and communities to study Torah and the teachings of our ancient and modern sages that support care for the Earth and the creatures who live upon it. We encourage study of science, ecology and the environment, to learn what we can do and what we need to change in order to live in a more harmonious relationship to the Earth. We encourage individuals, congregations and communities to make environmental issues personally relevant through learning about each community’s local ecosystem, about food security, and about how energy is used and generated where they live. We call upon our members to share their creativity and the creativity of their communities in finding interesting and fun ways to address climate address and to speak out in support of the Earth. In the world of feeling and relationship (Yetzirah): We encourage individuals, congregations and communities to explore the ways we can reconnect to the Earth, including the use of rituals from the eco-spirituality movement. We note that reconnecting to the Earth can deepen our human community and our connection with other creatures, and enlighten our relationship with God. On a more concrete level, we encourage individuals, congregations and communities to look at the relationships created by where our food comes from and where we invest our money, and to consider both using and investing in green and sustainable products and services, and, whenever possible, to move investments away from industries that engender climate change. We encourage the development and implementation of programs that support this goal. In the physical world of action and manifestation (Assiyah): We call upon individuals, congregations and communities to reduce our carbon footprint on a daily basis by conserving energy, by using renewable sources of energy, and by recycling and reusing whenever possible. Though the effect of actions like recycling is small, it is vital to model in our own lives the changes we seek on a global scale. We also call on individuals, congregations and communities to engage their political officials, community boards, and the like, in environmental issues, including developing sustainable power and zoning for sustainable development. We support the wide dissemination of the idea of eco-Kashrut, and the implementation of new forms of certification that make sure that the products we use are grown, processed, transported, stored and sold in just and sustainable ways. In the Talmud (Kedushin 40b), the question was posed, “Which is greater, study or action?” Rabbi Tarfon answered: “Action is greater.” Rabbi Akiva answered and said, “Study is greater.” All the others present answered and said, “Study is greater, for study leads to action.” In light of this teaching, we need to find new and creative ways to integrate study and action, and to integrate all four worlds, in the effort to stop or mitigate climate change. To this end, we recommend that a collection of “Climate Change” resources be presented on ALEPH’s website in its public repository of resources, and call on all members to contribute their offerings. We also recommend that at least once a year, a report be made to the Board and members with highlights of relevant study, advocacy and other actions and activities taken by members, supporters and allies. Composing poetry and music such as Cantor Richard Kaplan’s Kinah L’churban Gan (archive.chazzanut.com/hanashir/msg10437.html) and Tamara Cohen’s Eicha for the Earth (fore.research.yale.edu/files/Eicha_for_Earth.pdf ) for Tisha B’Av. Composing prayers such as Rabbi David Seidenberg’s Prayer for the Earth (neohasid.org/stoptheflood/earthprayer/) that specifically address climate change. Developing commentaries and study resources such as Rabbi Arthur Waskow’s commentary on the second paragraph of the Sh’ma (theshalomcenter.org/node/219) and Rabbi Elisheva Brenner’s syllabus on eco-Judaism (ruachhaaretz.com/EcoJudaismSyllabus.html). Creating certification programs like Magen Tzedek (http://www.magentzedek.org) and Uri L’Tzedek (http://www.utzedek.org). Developing investment programs like the Shalom Center’s Move Our Money/Protect Our Planet program (https://theshalomcenter.org/content/move-our-money-protect-our-planet-god-earth-strategy).